Walter Foster.The innovative Layer-by-Layer" instruction method simplifies the painting process so anyone can create an original work of art in just nine easy steps! Buffalo Grove loves the Walter Foster line. The full-color, 16-page book includes unique layer-by-layer instructions, foolproof color mixture formulas, and plenty of tips to guide you through the painting process. 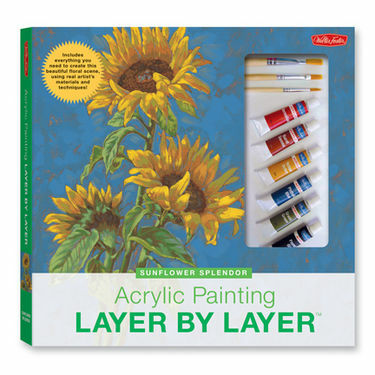 Plus the color-measuring grid takes the guesswork out of paint mixing, and the preprinted canvas board, quality brushes, and water-based acrylic paints provide everything else you need to complete this beautiful sunflower scene. Even if you’ve never before picked up a paintbrush, you can produce a work of art you’ll be proud of with this unique kit! Layer by Layer will show you how to paint successfully, using the same tools and techniques professional artists use. If you've ever been to Buffalo Grove, this kit sums up its strengths. 12.25" x 12.25" x 1.25" PLC case includes 16-page paperback book, preprinted canvas board with scene, 8 tubes of acrylic paint, 3 paintbrushes, palette knife, and color-measuring grid/mixing palette.